Welcome to National Suicide Prevention Week 2015. The lie is that depression and suicide are things that we can’t talk about. It’s a lie that causes people to feel alone and live alone when it comes to their pain. The truth is that, as people, we all relate to pain. We all struggle from time to time, we all experience sadness, and we all encounter huge questions in this life. All of that is part of this human experience that you and i keep waking up to. And with all of that in mind, welcome to National Suicide Prevention Week. This week, people all across America are pushing back at the lie. Thousands more will join them on Thursday for World Suicide Prevention Day. Together we will say that it’s important to talk about mental health and suicide. Together we will say that it’s okay to be honest and it’s okay to ask for help. Together we will say we’re not alone. Here at TWLOHA, we’re asking folks to think about tomorrow. Suicide means a story ends too soon. Hope means believing that tomorrow can be different, that life is worth living, that it’s possible to change. Above all else, we choose to stay. We choose to fight the darkness and the sadness, to fight the questions and the lies and the myth of all that’s missing. We choose to stay, because we are stories still going. Because there is still some time for things to turn around, time for surprises and for change. We stay because no one else can play our part. Show your support with our World Suicide Prevention Day pack. All of the items in the pack are meant to equip you to talk about suicide prevention in your community. Use them as conversation starters, encouraging reminders, and informative tools to share with others. Finally, be sure to wear your shirt and bracelet on World Suicide Prevention Day, which is this Thursday (September 10)! You can get your WSPD pack here. Every dollar raised through our Classy page will go directly to treatment and recovery. So far you’ve helped get us more than halfway to our $75,000 goal. As a sign of our thanks, every person who raises $100 will receive a poster signed by the TWLOHA team, and every person who raises $300 will receive a $50 gift card to the TWLOHA store. The donations must be made between now and Sunday (9/13) at midnight EST. Download this printable PDF and tell us why We’ll See You Tomorrow. Post it on social media by tagging @TWLOHA and using #Tomorrow15 or #WSPD15. Use our NSPW assets to change your profile photos, cover photos, and header images. 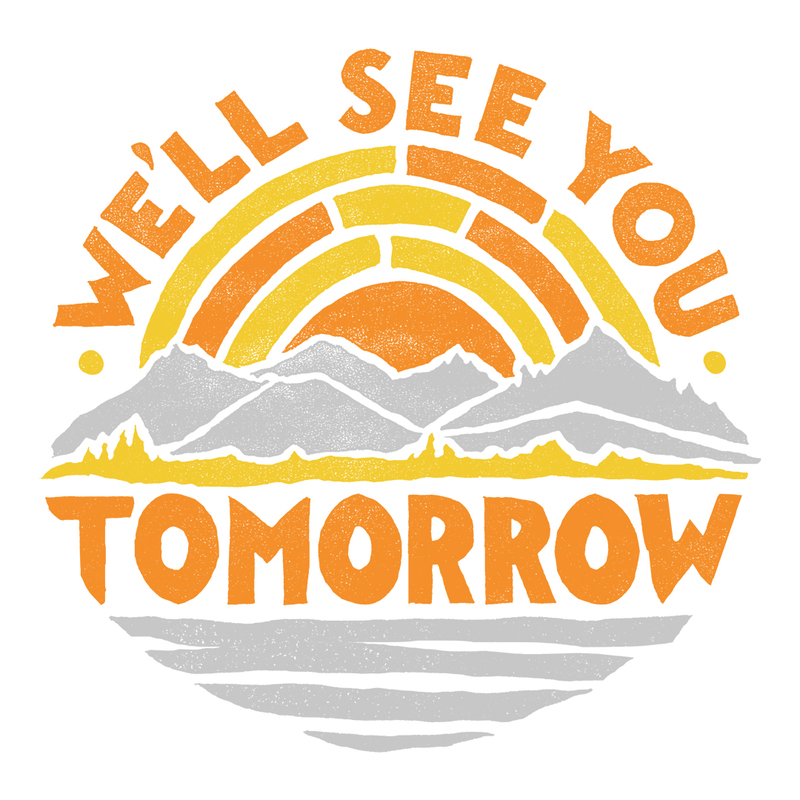 Throughout the week, share what you’re doing to start conversations about suicide prevention using #Tomorrow15, #NSPW15 (for National Suicide Prevention Week), and #WSPD15 (for World Suicide Prevention Day). Don’t forget to tag @TWLOHA on Instagram & Twitter! Pingback: Tomorrow | Girl, Uninhibited. on there wrist on Thursday in order to raise awareness. If there is anyway I can help please tell me. I’ll try to donate as soon as I can. Hi Sheila, I’m sorry to hear of your recent losses. Also your your dad being ill. I can relate as I’ve experienced similar. I’m sending you a big hug. Remember to take care of yourself. When things get really loud, perhaps try taking a walk? A little exercise can go a long way, and is excellent self care. You’re in my thoughts. This comment could not be shared due to the nature of the message. Thank you so much for sharing part of your story with us. If this is an emergency or if you need immediate help, please call and talk to someone at 1-800-273-TALK or reach out to the LifeLine Crisis Chat at http://www.suicidepreventionlifeline.org/GetHelp/LifelineChat.aspx“. We also have a list of local resources and support groups on our FIND HELP page. Please know that we also respond to every email we receive at info@twloha.com. Hey i dont have an instagram or twitter account because my parents say that it’s a terrible way to let the drama roll in…is there another way that i could use these? What other social media are you guys on…I have a tumblr. If you guys have one i can tag you there. Always keep an eye on those around you. You might be their last hope! I just found you on Jared’s site.. Wished I had found you sooner. I would have loved to have purchased a packet for today. Many thanks for your support in fighting a silent battle. It may be hard to be strong on ur own so if u need it my shoulder is here to lean on. My daughter lost one of her best friend to suicide about a year ago. She suffers from depression now and misses her friend like crazy. She has had a history of ______ in the past and finally got her into see an psychiatrist and taking ______. What Jared and you people do are amazing and I know it isn’t easy. But just know it does help people suffering. Please continue what you do, and Jared Thank you, maybe someday will be able to meet you and tell you face to face what you are doing! I’m about to become enrolled in a MS program for addictions. It’s through Kaplan University. Best regards to everyone, Take care! I wish I would’ve come across this sooner I would’ve loved to be apart of this and wear the shirt and bracelet and go around and do this!!! I’m really bummed I missed it. Can u email me next time there’s a campaign??????? Thanks!!! !